It’s no surprise to anyone who reads this blog that I love dressing up! “Frosting” to me isn’t this stuff, or my Victorian stuff. This is my cake. I get lots of use out of it. I make it for specific reasons, outings, gatherings, and I build on it. Right now, all I have is a rather poofy petticoat and two very simple gathered skirts. To make the the black and white flowers skirt in these photos, I bought 3 yards of quilting cotton, cut it in half length-wise, seamed one side all the way up and only seamed up the second side part way so I could either insert a zipper or do an overlap with a button or hook and eye. I ended up going the hook and eye route so that it’s much more adjustable. I hemmed the beast and then gathered it to a waistband. Simplest construction ever. Then, I decided on a whim to make a soft black bonnet so I could wear this whole outfit on the airplane on my way back to Indiana! I didn’t wear these heels but the rest is pretty much how I walked around San Francisco International Airport! Back to the bonnet! Here’s the tutorial I used. Only thing I did different was to add the lace to the top. It just wasn’t working for me with the lace on the bottom against my head for some reason. The tights are from House of Holland. I could own every single pair of their tights. They’re just too cool! These are the alphabet tights. Last year, my goal was focused on one word: Precision. I was really sick during most of 2013 (and I’m still not quite at 100% but I’m a lot better than earlier this year) which didn’t inspire me to go out to cons or do much dressing up so I think I’ll be rolling over this word to 2014. That said, this year, I’d like to focus more on my costumes. I end up buying fabric for blouses or pants or other things I’m just not going to make or wear. I either wear jeans and nerdy t-shirts or period clothing. So, I feel the need to stay focused on costumes and admit how much I like the things most people consider costumey. I don’t have plans to dress up like a pirate but I won’t say no to fabric, should I find it, for dressing up like Frozen’s Elsa! I’m also coming to terms that I don’t like prints. This little floral skirt doesn’t make me uncomfortable but 2013 found me making up clothes in prints I just don’t wear and so those clothes didn’t get worn. In many ways, I’m piggy backing on Rochelle’s awesome post about her review of the year. Go read it. It’s very thought provoking. Happy New Year! I wish for you the absolute best in all parts of your life, even the parts like flipping pancakes. I hope you flip the tastiest pancakes ever! And may your omelets never ever stick to the pan! You sound like me. I don’t think I will ever be one to bother making basics like tshirts and jeans (those are easy enough to buy). Sewing is simply more fun when you are building novelty & dress-up items! I think you and I need to plan an outing for 2014! I don’t know how we get caught up loving other things on other people’s bodies so much that we think that we should have them even if it is not “us”. I’m very guilty of having to have every popular pattern. Here’s to a new year of great health and of sewing for our authentic self! Nicely put! I agree. I’ve done that, too. Though, luckily, those patterns just tend to gather dust or that fabric gets used for muslins. hear hear! I’m with you. Let’s make stuff we like to wear! LOVE the tights… And the bonnet. Thanks for sharing how you did it. 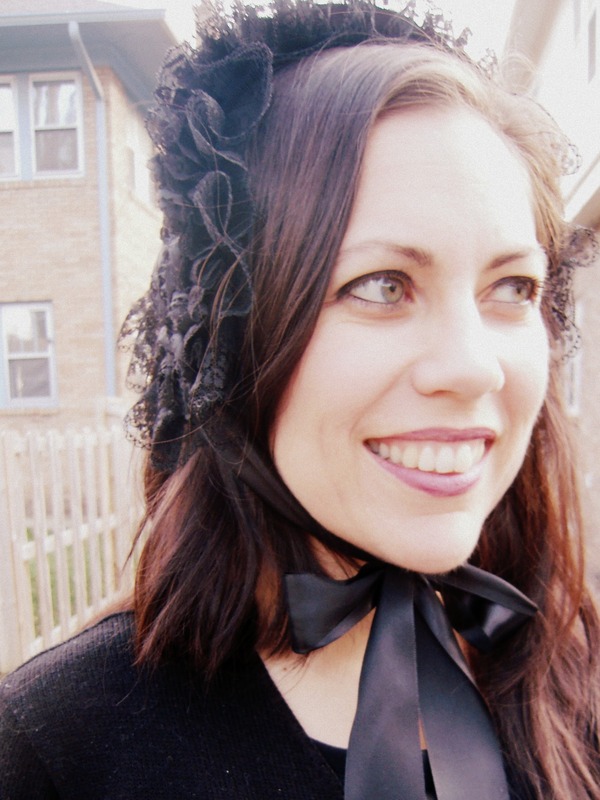 Can’t decide between that little bonnet or a little top hat for my Carnivale costume this year… I have SO many prints… but I rarely reach for them- except in a MAXI. 😀 I like your skirt… I like the petticoats. I like your photo shoot. Happy New Year!! Happy New Year, Laurie!! I can’t wait to see your Carnivale costume this year!! this is one cute outfit! Happy new year! Thank you! It’s so much fun to wear though I keep running into stuff. haha. Happy New Year Anne! Hello pretty Victorian mama, I love your outfit, especially your period inappropriate tights. Can I spell my name with all the letters? I might have to examine you closely to find out. Haha! You get all the points Heather! I have no where to wear them though and the “normal” handmade wardrobe I make is already causing waves where I live. Super cute outfit. Didn’t realize simply gathering all that fabric would result in such a cute skirt. I think I should make a petticoat this year. Petticoats are boring and I don’t like making them but they are soooo much fun to wear! 🙂 If costumes are calling you, you might want to listen. Is there a Halloween party or something you could go to? Well, hey, if you ever feel like venturing out to an event, let me know! They’re so much fun. You look fabulous Leila! Happy New Year and I hope it’s an awesome one. Thanks Vicki! Happy New Year to you too! You look great in this outfit! The hat is a nice touch, too. Congrats on a lovely ensemble! You look fantastic in your NYE outfit! The skirt is wonderfully poofy! And, thanks for the link on the tights, those are amazing! Thank you. I think everyone should have some of these fun tights! Happy New Year.